Our Small Industrial Dust Collector is designed for smaller applications but still use our advanced compressed-air, self-cleaning technology. Our top of the line dust collectors can filter out sub-micron sized dust particles in continuous operating mode and our sealed mechanisms and easy access doors make maintenance as simple as possible. These Small Baghouse Dust Collectors offer a great value for smaller businesses and their smaller footprint means it can be installed in much tighter spaces. Hi-Tech LC series self-cleaning baghouse industrial Dust Collector, suitable for all types of granular dusts and air pollution control, this dust collector is ideal for your shop or anywhere indoor air quality is a concern. Powerful, but gentle high-volume / low-velocity pulse jet for stable dust cake, 1/3 pressure drop, less cleaning frequency and prevent wear and tear of filters. 99% efficient on all types of particulate dust and produces no “puffing” during a cleaning pulse. Positive seal system; Prevents harmful dust leakage to the outlet. Easy to service; bottom load bags and cages. Large access door; for easy service. Optional perforated baffle; Optimize air and dust distribution over all filters, reduces effects of abrasive dust. Hopper or Low-profile dust drawer styles available. Affordable Purchase Price, 30-40% smaller foot print, this dust collector is a compact version of our acclaimed heavy duty Ultra-Flow Baghouse Dust Collector. Lowers Yearly Operating Cost, 25-45% Lower power consumption and compressed air usage, and 50-80% Lower maintenance and operating cost. Built to ISO 9001:2008 and CWB Certification, Your Guarantee of Quality and Reliability. Designed, Engineered and assembled in the U.S.A. and Canada. Our component suppliers are strictly U.S.A. and Canadian. See what sets ULTRA-FLOW aside from all the rest in our Catalog (PDF). See how you can Pay for Your Dust Collector with Operating Savings (PDF). Dust Collector Selection Guide will convince you to leave it to the experts. 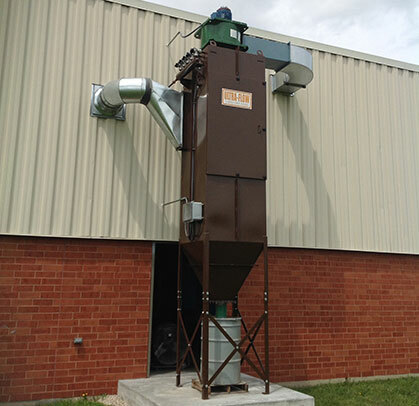 Purchasing your baghouse industrial dust collector through Quality Air Management means that you are getting the best product by a company that prides itself on the number of installations we have helped clients with their dust collection issues. Since the early 1980’s, our technology has been used in thousands of successful jobs around the world.